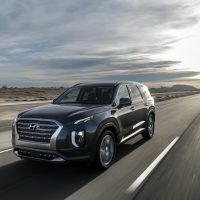 The 2020 Hyundai Palisade will arrive this summer, replacing the Santa Fe XL. 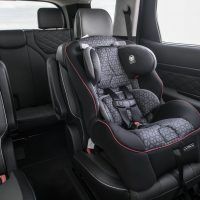 With seating for eight, it will likely be a top choice for larger and/or growing families. But it ain’t super pretty to look at. Yes, it has a lot of on-board technology. But that front end! 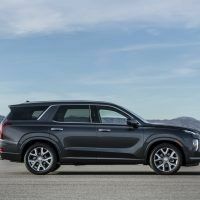 Okay, SUVs are The Thing, I get that. Everybody has to make SUVs, I get that too. 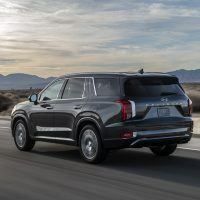 And everybody has to make a range of SUVs, up to and including big giant ones. I get that also. However, those are reasons, not an excuse. 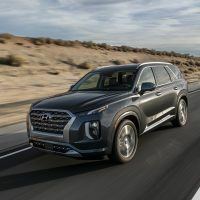 But this, the 2020 Hyundai Palisade? There’s no excuse for this. Sure, it’s as functional as a hammer, but boy, this thing is ugly. In the Air Force, people refer to the B-52 as the BUFF, Big Ugly Fat Fellow (change that “Fellow” out for another word that begins with “F” and isn’t polite to say on a family website such as Automoblog). 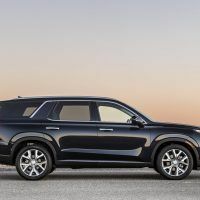 And that, sadly, describes most of the 2020 Hyundai Palisade. Sure, it’s not ugly from every angle, but it is Big and Fat from every angle. And that front end? Egads! 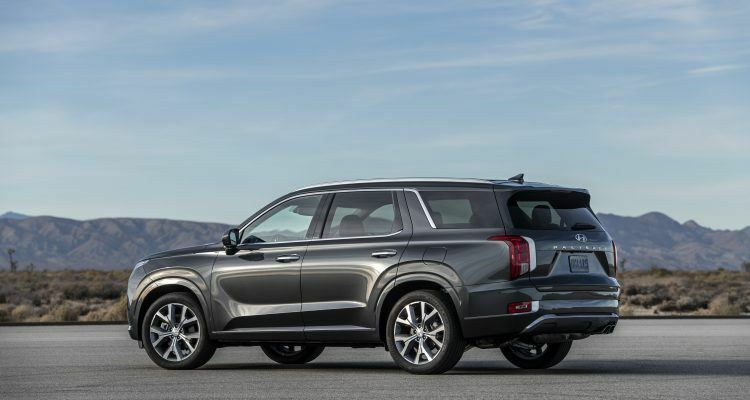 It’s like someone from Lexus said, “Beat that!” and the design team from Hyundai said, “Hold My Beer.” I swear to Mireuk, the Palisade’s front end would look better after you ran it into a bridge abutment. I will say I really like the name Palisade though. It’s kinda classy and reminds me of that Freddy Cannon song written by Gong Show creator and alleged CIA hit man, Chuck Barris. That’s the bad news, overall, but what’s the good news? First off, you know this thing is going to work. Hyundai calls it a mid-sized SUV, but taping in at over 16 feet, I’ll defer to my own eyes in this case. 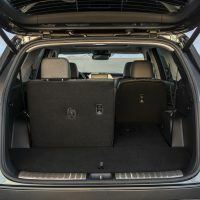 It looks immense and bulky and ungainly, which mean there’s lots of room inside. 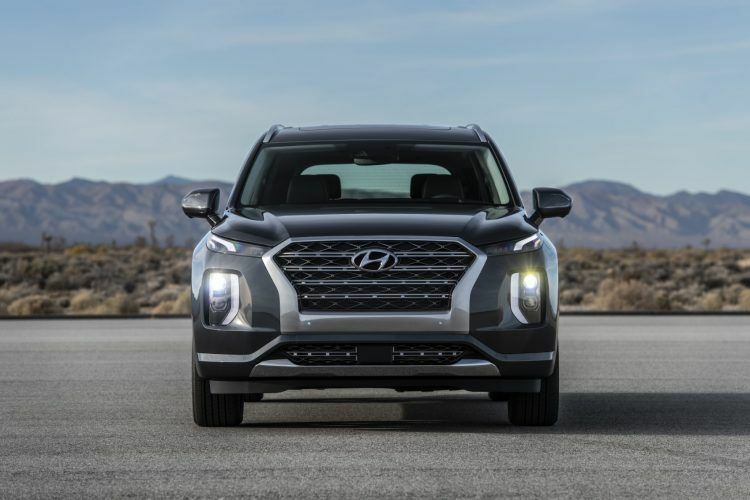 2020 Hyundai Palisade front end. 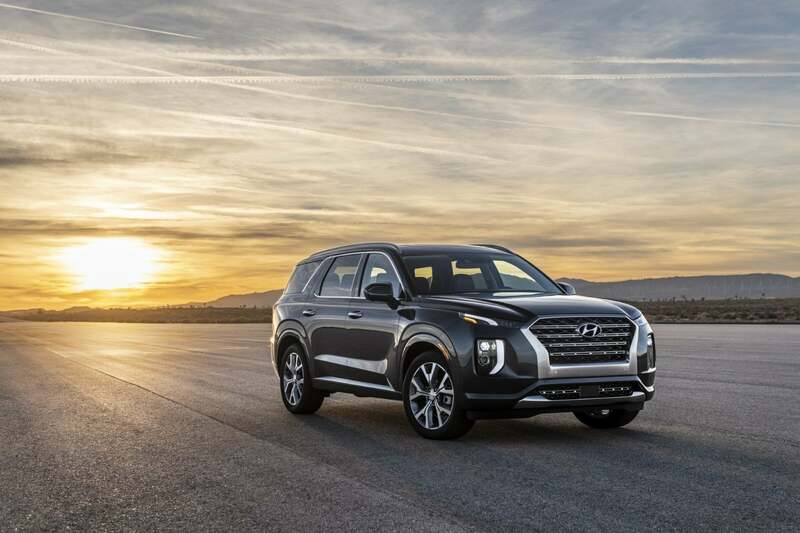 Photo: Hyundai Motor America. 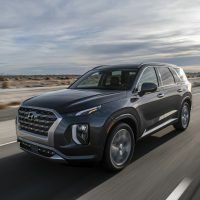 Related: The 2019 Hyundai Santa Fe is functional and much better looking. The interior aims to combine a sense of “relaxation and comfort” in a “serene environment” for eight (count em) eight passengers. Premium quilted Nappa leather is on offer and the instrument panel is layered in smooth wood grain. 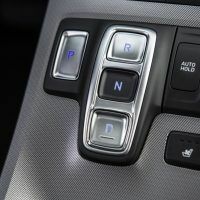 The second row seats move forward and out of the way via a button for access to the third row. 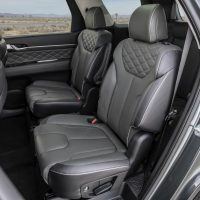 The third row itself has power-folding/unfolding and reclining seats. 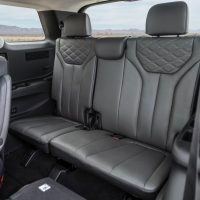 Second-row captain’s chairs are also available for the 2020 Hyundai Palisade, if you want to go that way. There’s a conversation mirror for the driver to clearly see passengers in the rear. This is a nice way of saying, you can keep the little nippers occupied and monitored using standard equipment. 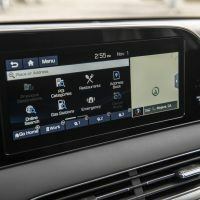 There’s a Blind View Monitor as part of the standard Blind Spot Collision Avoidance Assist system. It gives you a nice side view whenever you hit the turn signal. The multimedia stuff is, as one would expect, comprehensive. 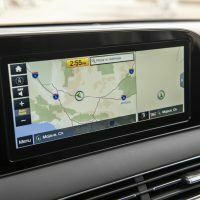 There’s a 10.25-inch touchscreen and a 12.3-inch fully-digital TFT center cluster with various view modes. 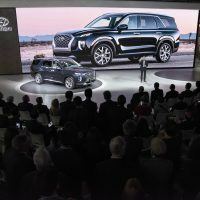 Hyundai put in their latest navigation system, Android Auto and Apple CarPlay, and a Qi wireless charging pad. 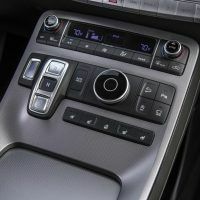 Two Bluetooth devices can be connected simultaneously while every Palisade has a total of seven USB outlets. And, of utmost importance: 16 cup holders! All this heft is powered by a not-small and not-all-that-bad of an engine. An Atkinson-cycle 3.8-liter V6 (dual CVVT/ direct-injection) putting out 291 horsepower and 262 lb-ft. of torque. 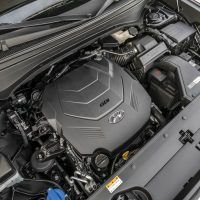 The power is delivered to the wheels through an eight-speed automatic with both two-wheel and HTRAC four-wheel drive options. 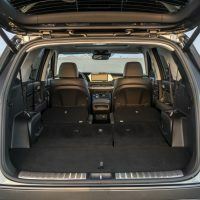 Gear selection is a shift-by-wire affair, meaning it automatically puts the vehicle into park when the engine is off and the driver opens the door. The HTRAC system also has a Snow Mode, with an electronic, variable-torque-split clutch and active torque control between the front and rear. 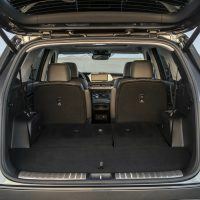 In other words, Snow Mode regulates front and rear torque distribution, left and right wheel slip, engine torque, and shift patterns according to available traction levels. 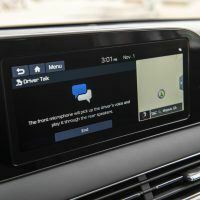 Normal, Sport, and Smart modes are in addition to Snow Mode. Pricing should be coming down the pike pretty soon. 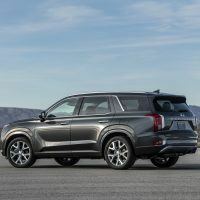 The 2020 Hyundai Palisade could be a good, solid, if ugly choice for your (family) hauling needs. Expect it at dealers this summer. Tony Borroz has spent his entire life racing antique and sports cars. He is the author of Bricks & Bones: The Endearing Legacy and Nitty-Gritty Phenomenon of The Indy 500, available in paperback or Kindle format. Follow his work on Twitter: @TonyBorroz. 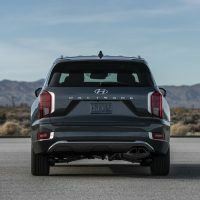 Photos & Source: Hyundai Motor America. 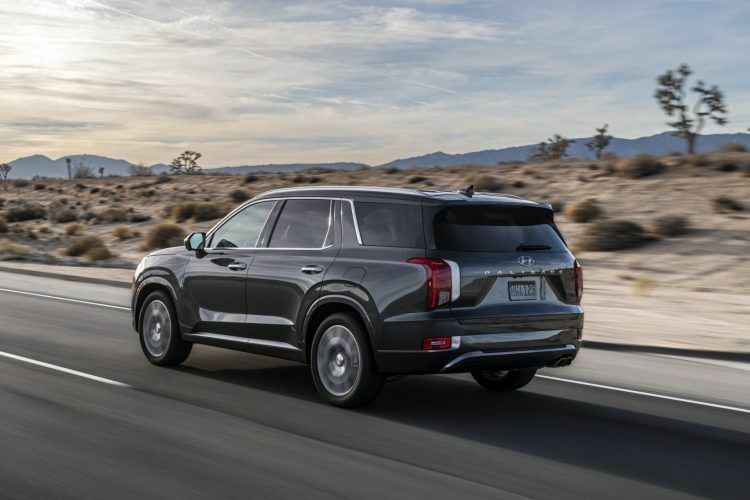 No Comments on "2020 Hyundai Palisade: If The B-52 Were An SUV"